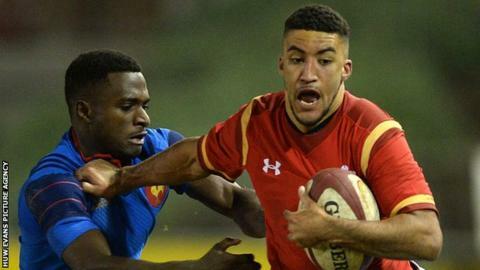 Wales Under-20s stayed on course for a Grand Slam as they consigned 14-man France to a first Six Nations loss. Wales defended stoutly in the face of French pressure and led 6-0 at half-time with two Billy McBryde penalties. France went ahead after the break with Alex Arrate's try but they then had wing Gabriel N'Gandebe sent off after he received a second yellow card. George Gasson finished a brilliant team move to give Wales a third win from three which puts them top of the table. Wales Under-20s: Rhun Williams (RGC); George Gasson (Dragons), Joe Thomas (Ospreys), Harri Millard (Cardiff Blues), Keelan Giles (Ospreys); Billy McBryde (Scarlets), Reuben Morgan-Williams (Ospreys); Corey Domachowski (Cardiff Blues), Dafydd Hughes (Scarlets), Dillon Lewis (Cardiff Blues), Shane Lewis-Hughes (Cardiff Blues), Adam Beard (Ospreys), Tom Phillips (captain, Scarlets), Shaun Evans (Scarlets), Harrison Keddie (Newport Gwent Dragons). Replacements: Ifan Phillips (Scarlets), Rhys Fawcett (Scarlets), Leon Brown (Newport Gwent Dragons), Bryce Morgan (Newport Gwent Dragons), Morgan Sieniawski (Cardiff Blues), Declan Smith (Scarlets), Kieran Williams (Ospreys), Joe Gage (Ospreys). Replacements: Emerick Setiano, Pierre Bourgarit, Elies El Ansari, Theo Hannoyer, Matthieu Voisin, Alexandre Pilati, Damian Penaud, Baptiste Couilloud. Is Friday night all right for rugby? Read more on Six Nations 2016: Is Friday night all right for rugby?